Rows of shops selling beach buckets and flip-flops line the seafront of Benidorm, the Costa Blanca's largest and liveliest holiday resort town, where hordes of tourists throng the streets 24 hours a day. Of the thousands who come to holiday here on the town's three miles (5km) of white sandy beaches each year, many have stayed and purchased apartments in the numerous blocks that now dot the skyline. 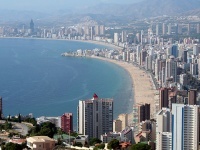 Benidorm, north of Alicante, is the party capital of the Costa Blanca with an unrivalled nightlife and a daytime carnival-like beach culture. Remnants of Benidorm's historic past are now well hidden, but tucked into the Casco Antiguo section are the ruins of a castle built in the 14th century to fend off Berber pirates. Benidorm's spectacular sunsets are best viewed from the castle's mirador (balcony). The place to see and be seen in the town, however, is the Playa de Levante, a two-mile (3km) boardwalk lined with trendy cafés and bars. Benidorm is a wildly popular resort with all the amenities one would expect. 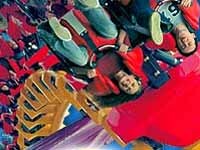 Benidorm is not a good choice for those wanting an authentic, or peaceful Spanish holiday, but for those looking for entertainment and nightlife it can't be beaten. The resort abounds with hundreds of persistent touts trying to sell tourists everything from trinkets to timeshare apartments. There are also insistent promotions staff outside the bars and restaurants, but these may be worth chatting up as they sometimes offer free drinks.